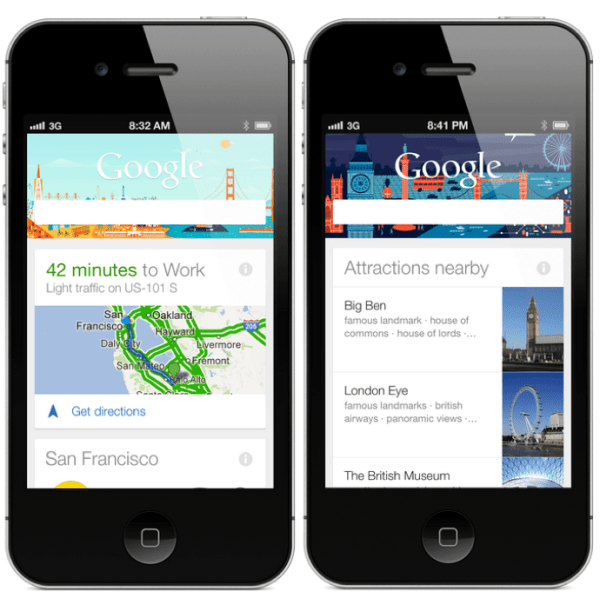 Previously Android-only, Google’s “predictive search” tool Google Now is now available for the iPhone and iPad. It’s part of an updated Google Search App for iOS. Google Now for iOS had been anticipated since March, when Engadget discovered a promotional video suggesting it would make the leap. Until its release this morning, Google Now had been available exclusively on devices running Android 4.1 (“Jelly Bean”) or higher. Danny Sullivan has written a companion article, The Amazing “Google Now” — When Google Searches Before You Think To, which provides additional background and a reintroduction to the service. The images immediately below are screenshots provided by Google illustrating how Google Now results will look on the iPhone — essentially identical to the Android version. Google Now cards offer information on traffic, weather, sports scores, nearby places, currency conversions, movie showtimes, package tracking and considerably more. It’s a growing list of categories and data sources. Google Now will even prompt you to continue searching on previous search topics (e.g., flights to Kona). 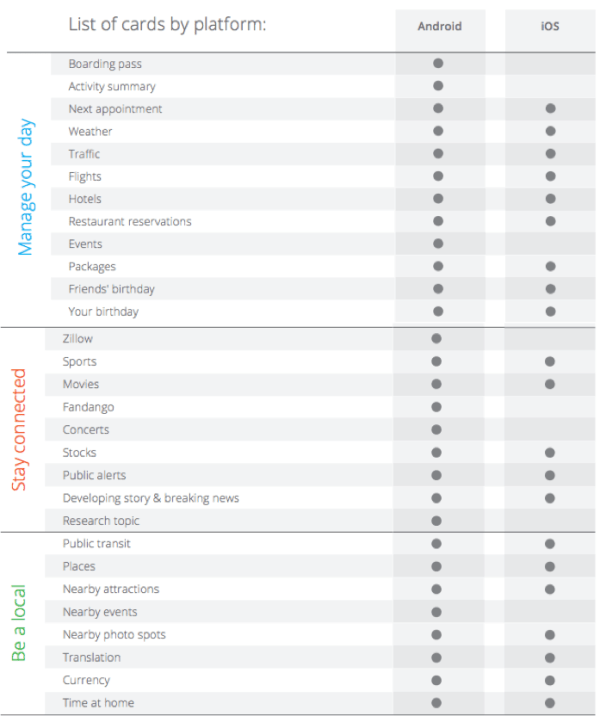 The chart below shows the full range of content and information available via Google Now. As a general matter, in the iOS version, Google Now will provide essentially the same content and functionality that Android users have been enjoying. The major difference is that the full range of information “cards” won’t be immediately available for iOS. We understand they will eventually come over, however. Google Now is a compelling product and has improved since its launch last year. It also illustrates how the future of search will be different from its past. The combination search/Web history, data and context enable Google Now to give users lots of personalized information about lots of things without having to ask for any of it. Google Now embodies both of those sets of aspirations. However one question is whether iPad and iPhone owners will actually use it. An online survey I conducted in June of last year (n=503 iPhone 4S owners) found that most people either searched from the Safari toolbar (using Google as the default engine) or went to Google.com on the mobile Web. Just under 20 percent of respondents said they used the search app. Which of the following do you use MOST OFTEN to search the web on your phone? These survey responses shouldn’t be seen as definitive, but merely indicative, that most iOS users don’t currently use the search app as their primary way to access Google. In that context, Google Now for iOS can be seen partly as a bid to get iOS users to both sign in (which is a requirement) and search more. Beyond all the “under the hood” capabilities, Google Now translates the otherwise basic mobile search experience into a richer and more dynamic app-based experience. A viral campaign is the marketing equivalent of winning the lottery ticket. A well executed viral campaign can spread on its own, leveraging the power of social media and word of mouth. Viral campaigns can dramatically increase brand awareness, improve sales, and catapult a hitherto unknown brand into public consciousness. No talk of viral campaigns would be complete without a mention of Old Spice’s groundbreaking “The Man Your Man Could Smell Like” campaign. 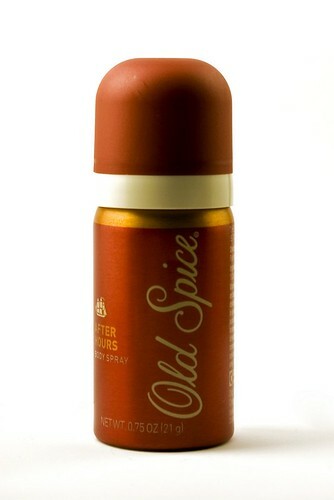 As one of the first consumer product companies to crack the viral code, Old Spice (and Isaiah Mustafa, the eponymous ‘Old Spice Man’) benefitted greatly from the campaign. While the original campaign ad with a barechested Isaiah Mustafa was liked well enough, what truly set the campaign apart (and set the wheels of virality) in motion were the short, funny video responses the Old Spice team created for celebrities, including social media heavyweights like Perez Hilton and Kevin Rose. Tweets from Rose, Hilton and Demi Moore, among others, soon grew into exponential traffic that landed the campaign into the annals of viral marketing history. Takeaway: While quirkiness and humor were the two key ingredients of the campaign’s success, marketers must also learn how to target the right audience for maximum impact (in Old Spice’s case, it was tech mavens like Kevin Rose who set up the viral platform). A strong voice and easily identifiable image goes a long way as well. The Old Spice Guy ad debuted at the biggest arena of them all: The Superbowl. Dollar Shave Club, on the other hand, had a much smaller budget to work with. The small startup based out of Santa Monica, USA was one of the viral stars of 2012, netting millions of views for its hilarious marketing video. The result? Millions of customers and a whopping $9.8 million in venture funding, all made possible by one simple video. Takeaway: You may not have P&G’s marketing budget, but that shouldn’t stop you from being successful. Dollar Shave Club showed how a no name brand with a solid product and a hilarious, honest video ad could disrupt an entire industry and win millions of customers in the process. Men’s razor industry is broken and dominated by a couple of companies. Dollar Shave Club knew it and exploited the fact fully in its ad. Throw in some humor, a price point of $1, and you can almost guarantee success. Sometimes, instead of glitz, glamour and humour, all you need is a fistfull of honesty and a good cause to rally an audience. The Invisible Children’s Kony 2012 campaign had that in plenty, which eventually netted them close to 97 million views on YouTube. The Stop Kony movement has an admirable cause: to bring the world’s attention to the genocide by the Lord’s Resistance Army in Uganda. With its heartfelt campaign, it shifted the world’s focus on the region, effecting a real change in the process. Takeaway: Sometimes, a real message is all it takes to break down the walls of virality. Strip away the razzmatazz and bare your soul to your audience. The results, as Kony 2012 demonstrates, may very well surprise you. “Push to Add Drama” – a seemingly innocuous button placed in the middle of a busy square in Belgium became the focus of a successful ad campaign by TNT. As hidden cameras captured bystanders walking up to and pressing the button, paramedics, policemen, and mafia criminals swarmed out, getting into fights, shooting guns and creating, well, ‘drama’. The reaction of the bystanders – surprise, shock, then joy – matched the TV channel’s message perfectly: “Your Daily Dose of Drama”. Takeaway: Capturing the reaction of everyday folks (even if they are actors and the footage staged) can not only be a great validation of your product, but lure the audience into the ad experience. Viewers who watched the bystanders giggle with delight couldn’t help but stifle a smile themselves, which is just what a brand wants. Felix Baumgartner’s jump from space was always going to be a media event, but Red Bull created a clever campaign that milked the event to the maximum. The campaign grossed over 170 million views on YouTube, spread across the main jump video and thousands of user created videos. 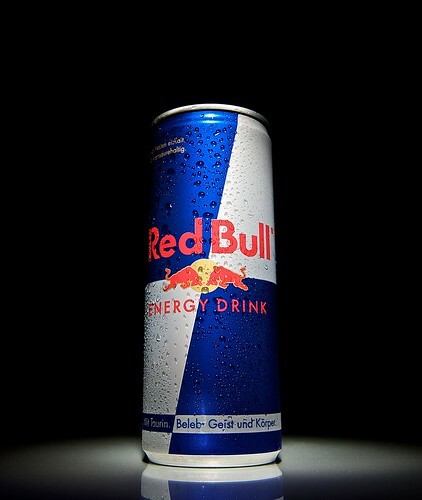 Brand Red Bull, needless to say, got a major boost from Felix Baumgartner’s death defying jump. Takeaway: Sometimes, the build-up to the event can be more beneficial than the event itself. Red Bull created a lot of buzz by releasing teaser videos before the jump, and invited viewers to create their own videos. The result was thousands of reaction videos that pumped up the view count, like Felix Baumgartner, to the stratosphere. Honesty, humour and a bit of daredevilry are proven ingredients for cracking the viral code. You may be working with the budget of a Fortune 500 company, or small startup, but that shouldn’t be any reason to not be successful with your viral marketing campaign, as the examples above show. This post is brought to you by top London University student and keen blogger Lucas, Lucas studied for a Masters in Public Relations and now enjoys blogging about PR and advertising. If you’re using social media for marketing, what should you say following a tragedy like the deadly blasts at the Boston Marathon on April 15? The horrific elementary school shootings in Newtown, Conn.? The October storm that took lives and devastated communities across the Northeast? The age of digital marketing brings with it new challenges, including how to respond during a national tragedy. Remember, as recently as Sept. 11, 2001, we had no MySpace, much less Facebook, Twitter or YouTube. Except for email, no vehicle for delivering instantaneous marketing messages existed. After 9/11, one of the most painful days in American memory, most of us had time to pause, reflect and put on hold print, radio and TV marketing campaigns that might be viewed as inappropriate or offensive. In recent months, there has been lively debate on this topic in the marketing community, including how and when to tie – or not to tie — a marketing message into the news of the day, a widely used strategy. Gaffes can occur with the most innocent of intentions in any media content, marketing or not. Earlier in April, a new episode of the musical comedy “Glee” upset and angered parents in Newtown, Conn., because the plot featured a student bringing a gun to school, where it accidentally discharges. Usually, however, simply applying your own sense of decency and good taste can help you avoid a blunder. Consider American Apparel’s notorious “Hurricane Sandy Sale – in case you’re bored during the storm,” advertised as tens of thousands of people endured freezing temperatures without power. Most of us wouldn’t have even considered such a ploy! • If you use automated posts scheduled through a site such as HootSuite, turn them off immediately. If people don’t find them insensitive and uncaring or silly, they’ll likely conclude your messages come from a robot – not a real person – which is just as bad. • Can you be helpful? Hours after the blasts in Boston, with cell phone service out in the city and family and friends desperately trying to connect with loved ones, Google.org launched “Person Finder: Boston Marathon Explosions.” There, individuals and organizations could share information about the status of marathon participants and spectators for those trying to find them. If your community has suffered a tragic event, perhaps you have helpful information to share. Here in Florida, which is affected by hurricanes, people use social media to help evacuees and their pets find shelter, and to alert others to danger, such as downed power lines. Depending on your area of expertise, you may be able to provide more general information or commentary. For instance, an educator can share tips for answering children’s questions about the event. Philanthropists might comment on those selflessly step up to help. • Of course, social media is also about reactions and, for many, that’s a sincere expression of sympathy for and unity with those affected. If you want to post something and you’re unsure about what to say, take a look at what businesses and other brands are sharing, and how online users are reacting. You may decide to just say nothing for a day or two, or whatever time seems reasonable given the nature of the event. Sometimes, saying nothing at all speaks volumes. Marsha Friedman is a 23-year veteran of the public relations industry. She is the CEO of EMSI Public Relations (www.emsincorporated.com), a national firm that provides PR strategy and publicity services to corporations, entertainers, authors and professional firms. Marsha is the author of Celebritize Yourself and she can also be heard weekly on her Blog Talk Radio Show, EMSI’s PR Insider every Thursday at 3:00 PM EST. Follow her on Twitter: @marshafriedman. Apple’s iPad is gaining phenomenal popularity among business people. The state-of-the-art tool allows people to run small companies and an endless stream of chores on the go. The glamorous gadget has made it possible for people to control corporate strings, anytime and from anywhere. Thanks to the assortment of apps available, the busy entrepreneur does not have to run to the office to accomplish the smallest and simplest of tasks. There are so many iPad apps that one is absolutely spoilt for options. In order to make the most out of them, the trick is to find the right app and get the job done without hassle. The following is a list of apps that promises to help a business grow. They have been specifically designed to increase a business’ productivity and breathe life into the idea of a virtual office. A lot of these apps are available for iPhone as well. Since updates in technology are commonplace, it is recommended that you read an app’s details to make sure if the current version can meet your needs or not. This out-of-the-box app allows you to accept payments from credit cards through your iPad. The app comes with a free card reader. The transaction fee is quite affordable as well. Available for $3, this app is one of the most celebrated PDF readers for the gadget to date. An individual no longer needs to carry a bundle of catalogs and brochures along. Why not show everything in PDF format on your iPad instead? Checking your website’s analytics is now easier than ever before with this app. You can check your stats on Google Analytics anytime on your iPad. The app is available for $6.99. The app comes with a 30-day trial offered absolutely free. It facilitates business owners to manage and control all sorts of sales operation. If you are satisfied with the trial version, you can get the paid version for a reasonable price for more comprehensive features. Are you sick and tired of going to those business meetings? Now, you can participate in a meeting virtually without leaving the confines of your home. This free iPad app allows you to attend meetings on your gadget. How about accessing and viewing your Windows Vista, Windows 7 or XP Professional workstation right there on your tool? It would look exactly as you are working on your desktop. Amazing, isn’t it? This is what the RDP lite has to offer. The app is offered for free but a paid version with additional features can be acquired for a mere $5.99. Calling your secretary each time you need to dictate a note can become annoying. How about an app that gives you the ability to visualize your speech as text? As soon as you speak in your phone, the app converts your words into text. You can then use the text as an email or update you status on Twitter or Facebook. Get your hands on these remarkable apps and run your business the smart way. If you want your business to do better, you really only need to have one thing: happy customers. While customers in general will support your business, happy customers, the ones that are completely satisfied with your service, your products, and the experience you offer, will make sure your business succeeds beyond your wildest expectations. If you’re looking to put a few smiles on some customers, here are some tips you might find useful. Happy customers also mean satisfied customers. They’ve received the information they needed from you, nothing less and nothing more. While more content, more deals, and more emails might sound like a good thing from a business owner’s standpoint, you have to consider the perspective of the consumer. Most likely, you’re not the only business they’ve subscribed to. This means that in addition to your one or two emails per day, they’re also receiving emails, status updates, texts, and seeing advertisements from various other businesses. The last thing you want to do is be the business that goes overboard because they won’t hesitate to unsubscribe from your updates. After you’ve gained a new follower, like, email subscriber, or blog reader, thank them for their support and then give them some space. You’ve captured their attention, which means they’ll be more aware of the amount of content you send their way. If that content is too few and far between, they can quickly forget about you. On the other hand, too much content can be overwhelming, annoying, and misinterpreted as lower quality. None of these bode well for your business development purposes. Instead, find the right balance between the amount of content you send out and the time you send it out. Sending out smaller amounts of the right content at optimal times means that you have a higher chance at the success of that email, blog post, status update, or otherwise. If you’re sensing that your customers aren’t happy or you’d like to find ways to improve their experience with your business, the simplest way to find viable data is to simply ask them. That’s right; your customers partially hold the key to their own happiness. But it’s your responsibility as a business owner to unleash that insight and analyze it. You can ask for customer feedback a number of ways. The most obvious is through online surveys. But this requires asking the right questions in the right format. The trick is to figure out what you’d like to know the most and then ask it in the simplest way. For instance, if you’d like to find out how your customer service team is doing ask how customers would rate their experience when deal with them. Asking for an answer on a number scale like 1 being the best experience and 10 being the worst experience would make the question even simpler. Also, try asking the question again but in a different way. This gives you more data to base your analysis off of. For a similar question to our previous example, you can ask how likely your customer is to recommend the customer service team. Again, use a numbered scale for easy answering. You can also request feedback through social media, email newsletters, and posing questions at the end of blog posts on your website. Engage your customers and have them take interest in making the business they patronize better for their own benefit. You might want to offer deals, discounts, coupons, and other prizes for those who fill out the surveys. This will generate more interest, giving your surveys a variety of people to request feedback from. There are only a handful of companies that can get away with not offering any deals to their customers, but those companies have spent decades building up a reputation to do so. Apple, for instance, is know for it’s incredible customer service and top-of-the-line products, so customers are happy even though they almost never get a deal on a new mac computer. However, the rest of us have to find a way to compete and keep our customers coming back. Offering deals, exclusive memberships, coupons, discounts, or another type of content is a way to reward your customers. Don’t think of offers as giving money away, think of it as an investment in the happy customers you’ll make along the way. You could either start with small offers to get your customers buzzing or go for a great big sale or deal to get them really excited. Afterwards, you will have established long-term relationships with many customers that might even do some word of mouth marketing for you. Offer rewards every now and then to keep customers looking forward to coming back into your store or onto your website. Turning regular old customers into happy, satisfied customers means your business can do more and more. Instead of worrying over the perfect product, the perfect website, or the perfect Twitter account, worry yourself with how to make your customers smile every time they think about your business. Happy customers like that will keep your business alive for years to come. Pete Wise is a copywriter working for Luminar Insights, a source of hispanic data. When I’m not writing articles, I’m posting to my LinkedIn page. Lawyers of all shapes and sizes, from all walks of life, practicing in various industries, and regardless of whether they’re a female or male need to know a thing or two about dressing for success. It doesn’t matter if you’re already an associate or you’re just finishing up law school, these tips will apply to interviews, company mixers, and your every day job. Many people like to avoid dressing for success because they believe their skills and their talents should speak for themselves. And this is absolutely true. But you shouldn’t think of dressing for the job as a means of vanity. Dressing up, playing the part, and looking sharp while doing so is about coming off as confident, put-together, and intelligent. That’s right, the clothes you wear and the way you wear them can influence how others perceive you. And to lawyers who must constantly sell themselves to clients and sell their clients to juries, there’s no better way to make an air of distinction than with a great suit. Here are a few secrets on dressing for success. You’ll look good, but you’ll feel good, too. A common mistake many people make when picking out clothes is not knowing their size. You might pick out a slick $5000 suit, but if it doesn’t fit right, you might as well be wearing a potato sack! Size plays a major part in dressing up for the job, so much so that it can make a cheap dress look great simply because it fits correctly. If you’re unsure about your size, go to a tailor and get measured. Many department stores even staff their own tailors who are always available to make measurements. After you have a couple numbers to work with, the most important thing is to not be ashamed of them! If you think you’re too big or too small, it really doesn’t matter once you’ve got the outfit that fits right. Talk to a personal shopper or a retail associate about finding colors that look best on you, styles that fit your body, and trends you can own. Stripes look good on just about everybody, and so do neutral colors like navy blue. You can’t go wrong when you have a few of these essentials in your closet. We all have this image that lawyers are always dressed to the nines, making sure to have their suits dry cleaned and their shoes polished. In reality, only a small percentage of lawyers dress so extravagantly. The rest of us might work in more relaxed settings where a full suit and tie isn’t necessary; maybe just some khakis and a nice sweater. While this might be perfect attire for the office, it’s not necessarily perfect attire for meeting with clients. You know better that not all lawyers wear Armani suits, but your clients will be expecting someone with an air of confidence, someone who can fight their case like it was their own. Khakis and a sweater might not inspire that kind of confidence. The moral of the story is that you should always dress up, even when your office lets you sport a more relaxed feel. Afraid of being overdressed? The old saying, “It’s better to be overdressed than underdressed” starts to ring quite true here. People might scoff at a person in ripped jeans and white t-shirt, but they’ll almost never second-guess a person in a sharp suit. When it comes to your job, you really can’t ever be too dressed up. So iron those shirts, fix up those blazers, and make sure you look presentable no matter where you’re going or whom you’re meeting with. There are a lot of business fashion trends right now. Pointy-toed heels are in for women, striped suits are starting to make a comeback for men, and so on. But no matter which styles you like the best, remember to always have a little personal flair accompany your outfit. Whether it’s a tie, a fun watch, or your favorite necklace, making the outfit “your own” will sell it all the more. Be careful not to over accessorize or stray too far from social norms. Even if you’re a little bit ahead of the fashion trends, stick to mostly modern clothing and keeping it subdued. You’re in the business of helping others, so you should never wear an outfit that steals the spotlight for yourself. From job interviews to networking events to client meetings, you never know how people are going to perceive you. Therefore, you should always set out to make the best first impressions possible by dressing for success. Wearing clothes that fit, are considered “dressy,” and have a little bit of a personal touch are a safe bet regardless of what your schedule looks like. A business function is a great way to meet potential new clients as well as showing the ones you already have how much they are appreciated. Alternatively it could be a great way to show your staff a well-earned good time and pay them back for the hard work they do for your company. Either way though you need to ensure that you don’t go overboard and lay on a lavish evening when you really can’t afford it. Times are tough for businesses all over the world at the moment and therefore you will probably wish to put on a pleasant event without breaking the bank. Here are some great ideas for planning that all important business function on a budget. If you are trying to keep the costs to a minimum then this often depends quite a bit on how many people attend your event. You will obviously want all the important people to be there but you may want to consider whether you allow them to bring their partners or not. Making it a function solely for them is a great way of cutting your guest list in half nearly and will mean you can do more networking as they are more likely to mingle whilst away from the comfort of their respective plus ones. At these types of events entertainment usually comes in the form of music but this is also the perfect place to keep costs to a minimum. Consider foregoing a DJ and arranging the music yourself with the help of some speakers and an MP3 player. With the technology available today you should be able to pre-set the music you want and allow it to play through without being continually monitored. If alternatively you want to impress and entertain your guests with some live music then you could cut costs by only having the band play for a short while. Jazz music is great to have in the background at these formal occasions and jazz band hire will look the part without breaking the bank. Although the catering is one area where you can afford to limit costs somewhat; it is important that you still put on a good spread or your guests. The last thing you want is for potential business partners to be leaving your function with a bad taste in their mouths, literally. For most occasions you should be able to get away with a simple buffet but try not to scrimp too much on the quality of the food. It is better to have less food of a high quality which people will love than loads of tasteless food which will leave people wishing they had eaten before they came out. Ultimately the best way to ensure that your function is financially viable is to make sure you get some future business as a result of it. Therefore you should mingle as much as possible and try to spread the word about your company; gaining new contacts as you go. If you end up gaining a couple of yearly contracts from the event then the money outlaid will definitely be worth it. Chris Mayhew understands the need to budget everything effectively within a business. He is working on behalf of Sax and Honey who are a professional jazz band available to hire for weddings and business functions.